The streamlined, C - shaped arm of the carbon bed can be shot from the initial position of the X - arm to the rear of the leg plate, which can increase the shooting range of the C arm. The design of the auxiliary controller of the table, which provides a double insurance for the operation bed. German brands of hydraulic system with low noise, strong power, providing a superior positioning accuracy, control flexibility and running smooth. Easily slider universal casters,provides flexible mobility. Open communication interface design, rich software extension resources, can achieve efficient docking with the Digital Operation Room. It provides overload protection to motor, battery, battery valve,avoid dangerous hidden trouble.The protector will automatically pop up when overload, this time the machine stops running and solves the security problems, the bed body can work when you re- press into the protector. Patented lifting column technology, patented head plate holding hoop structure design,patented brake design and many other advanced technology application, guarantee the product's stability. 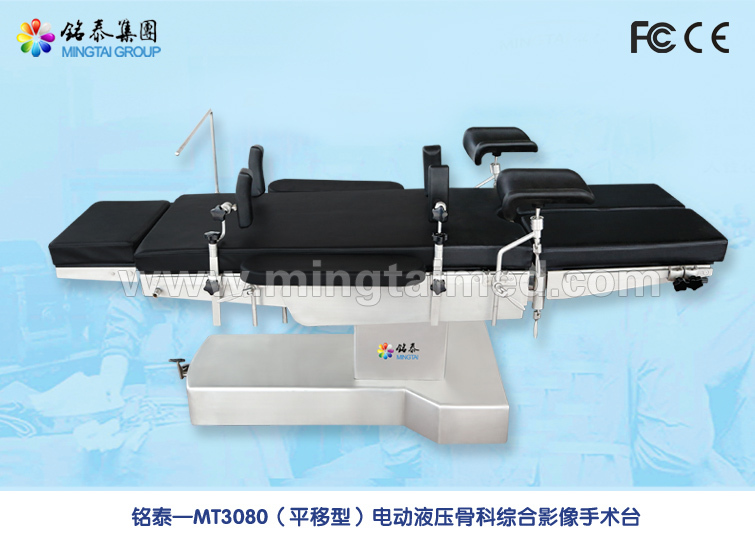 The base of operating table has a fixed or mobile function, mobile flexible, fixed reliable. Machine design in line with national medical electrical safety standards,with a variety of functions of 304 stainless steel manufacturing accessories, in order to suit the needs of different surgery. Looking for ideal Types of Operating Tables Manufacturer & supplier ? We have a wide selection at great prices to help you get creative. All the Electrical Hydraulic Operating Table are quality guaranteed. We are China Origin Factory of Operation Table Parts. If you have any question, please feel free to contact us.